On An Overgrown Path: Wilhelm Stenhammar - Excelsior! 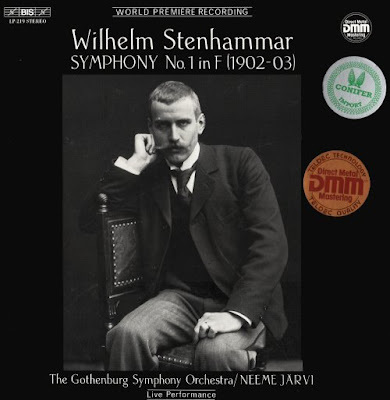 Wilhelm Stenhammar died eighty years ago today, on November 20, 1927. At the beginning of the twentieth century Swedish born Stenhammar was the pre-eminent Scandinavian composer and pianist. He played his own First Piano Concerto with the Berlin Opera Orchestra conducted by Richard Strauss and with the Hallé conducted by Hans Richter, and the Berlin Philharmonic under Arthur Nikisch performed his concert overture Excelsior! which is on the LP shown above. From 1907 to 1922 Stenhammar was artistic leader of the Gothenburg Symphony Orchestra. As well as playing his own works Stenhammar performed new compositions by Strauss, Reger, Debussy, Sibelius, and Mahler in Gothenburg, and became a close friend of Carl Nielsen after programming his music. 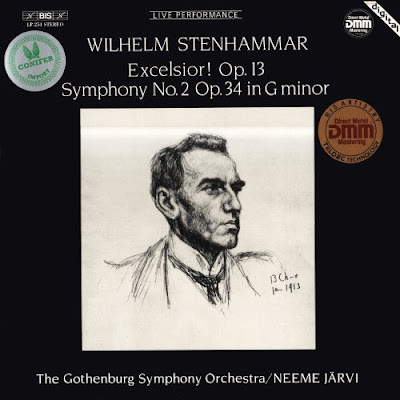 The Gothenburg Symphony Orchestra has continued to perform Stenhammar's music, and in the 1980s they recorded his two symphonies and Excelsior! under their, then, principal conductor Neeme Järvi. 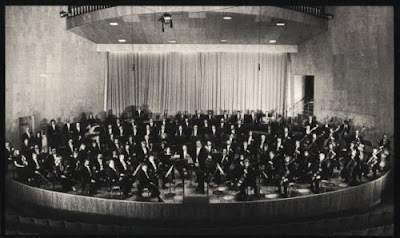 The recordings were made in the Gothenburg Concert Hall which is seen below, and were originally issued on the two BIS LPs seen in my header and footer images. Gothenburg Concert Hall was built in the decade after Stenhammar's death to a modern design by architect Nils Einar Ericsson, who used red maple for the interior surfaces. This resulted in exceptional acoustics which both BIS and Deutsche Grammophon have captured on some fine recordings including Järvi's cycle of the Berwald symphonies on DG. The sound from the BIS LPs of the Stenhammar symphonies is quite outstanding, helped by heavyweight Teldec vinyl pressings. Both recordings used just five Neumann microphones routed through a Swedish radio mixer. The First Symphony was recorded in 1982 using analogue tape and no Dolby, the Second in 1983 used an early Sony PCM-F1 digital recorder. The classic BIS album designs are by the label's founder Robert von Bahr, and the typography is by Marianne von Bahr. These magnificent BIS recordings live on in CD format. Given the vogue for Mahler and Nielsen today it is difficult to understand why Wilhelm Stenhammar's music is not better known. BIS has also done very fine things for the music of Antal Dorati. Those are classic recordings. I love them both!